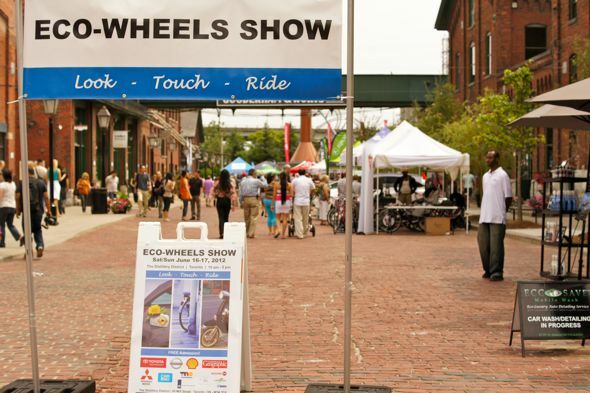 The 2012 Eco-Wheels Show at The Distillery District this weekend showcased some of the latest styles and trends in electric bicycles, electric motorcycles and electric cars. The Amego "Batmobile" e-bike prototype (lead photo) immediately caught my attention with its solid look and badass matte black finish. 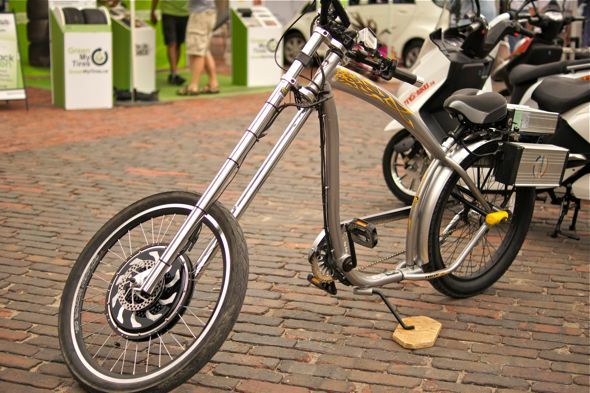 The focus of this year's show was the "increasing market appeal of eco-friendly transportation alternatives." And, like the Eco-Wheels Show I reviewed 2 years ago, there was plenty opportunity to look, touch and ride what was on display. 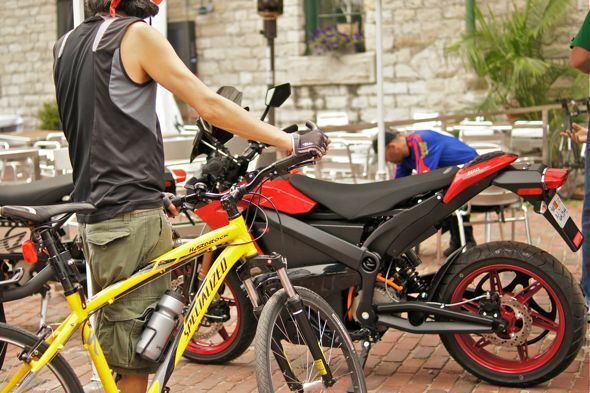 One of the members of the Toronto Electric Riders Association rode in on his custom-made cruiser-style e-bike tricked out with lithium batteries. Sweet ride! 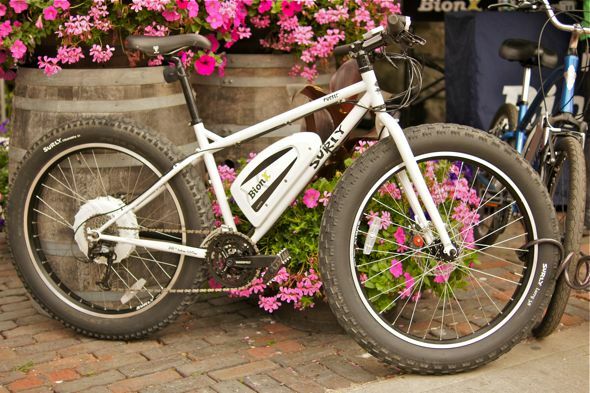 BionX International Corporation was on hand to showcase some of their BionX Retrofit Systems on a number of Surly bicycles, including this one (above) with monster tires that would allow year-round riding on Toronto streets and certainly help navigate all the streetcar tracks. I was pleased to see my old Veloteq Challenger RS-V still getting some good use -- now modified by its new owner with additional lights, horns, bells and a GPS mount. I put over 6,000 km on that scooter-style e-bike before going to "the dark side" of gas scooters. And it's easily seen at least that much more use in the last couple of years. 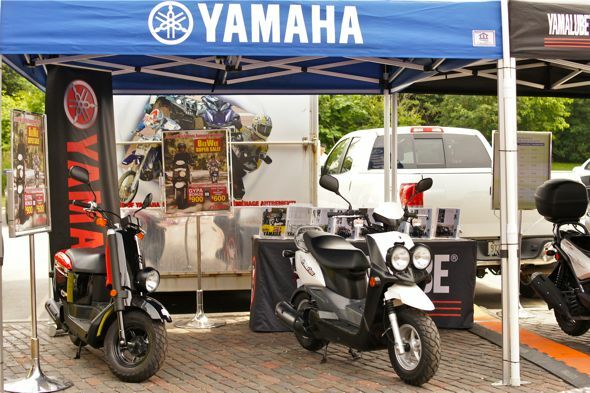 Yamaha was on hand to showcase their scooter line-up. While not running on electricity yet, like some of their fleet in Japan, they're still an eco-friendly alternative for those in Toronto, like me, who don't feel the need to own a car. 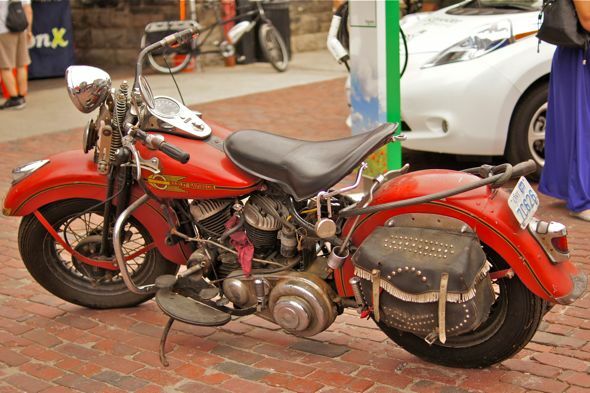 I'm not sure who brought this 1943 Harley-Davidson motorcycle to the show. But it sure looks fun to ride. We've come a long way, baby. Zero Motorcycles turned a few heads with their hot red Zero S all-electric motorbike. 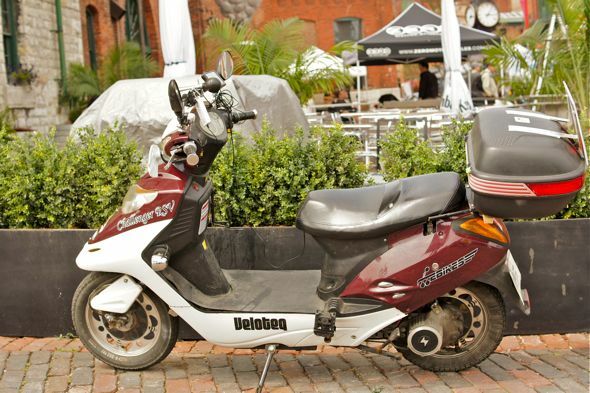 Its top speed (142 km/hr) is now comparable to my 300cc gas scooter. And the range-per-charge (up to 183 km) approaches the same distance I get per tank of premium gas. But I think I'll wait until the retail price (close to $14,000) comes down enough before I give this beast a more serious look. While less appealing to me personally, electric cars including the Nissan Leaf made an appearance. The all-electric Fisker KARMA turned a few heads, too. And rightly so. 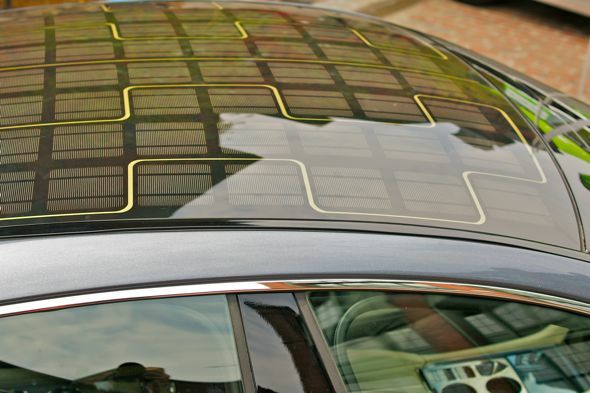 Its solar-panel roof was quite something to see on a car. Here's hoping that other manufacturers will clue in and start putting in some serious R&D into incorporating more of these innovations in their offerings soon. 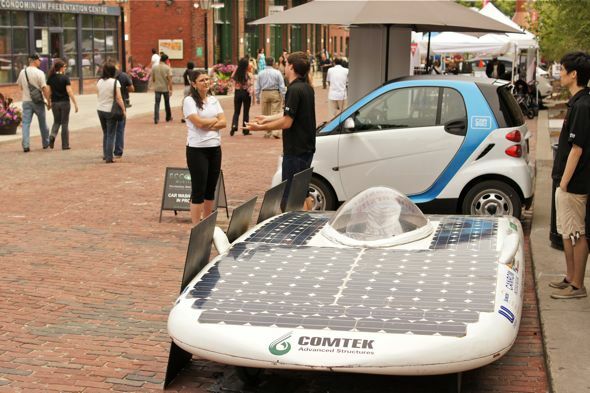 Because it's not quite feasible for everyone to be driving this solar car down city streets. Not yet, anyways. 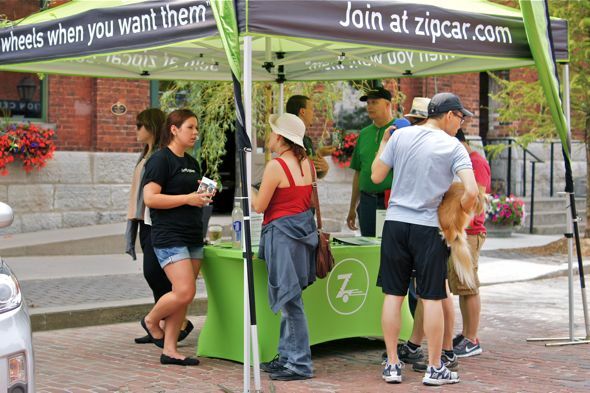 Zipcar was on hand to offer their spiel. And so was a new player in Toronto's car sharing landscape. 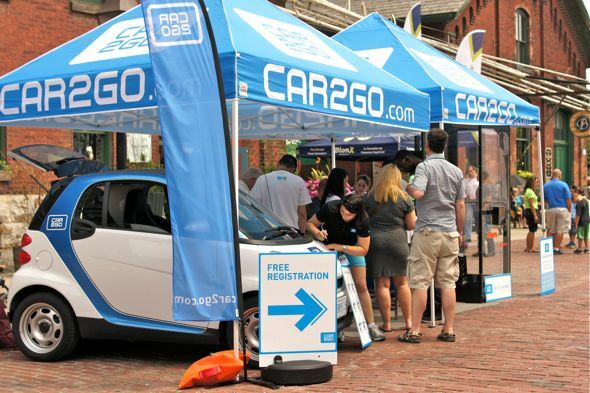 CAR2GO, with its membership-driven fleet of over 250 smart fortwo cars and offering per-minute, hourly and daily rates, I may just give them a go. It's a pity they don't offer Smart For Two Electric Drive cars yet. YMMV. 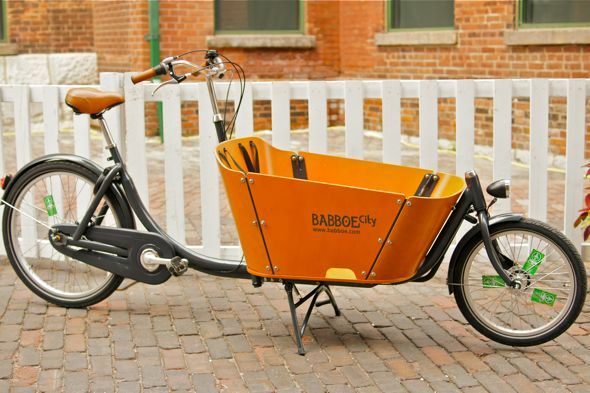 For those of you who haven't yet embraced your love for electric alternative vehicles and still want to get around the city with more gear, there's the Babboe City cargo bike from The Netherlands. I don't speak Dutch, but if the images on their website are any indication, it sure looks like a fun way to wheel your kids around. Just be sure they wear their helmets. 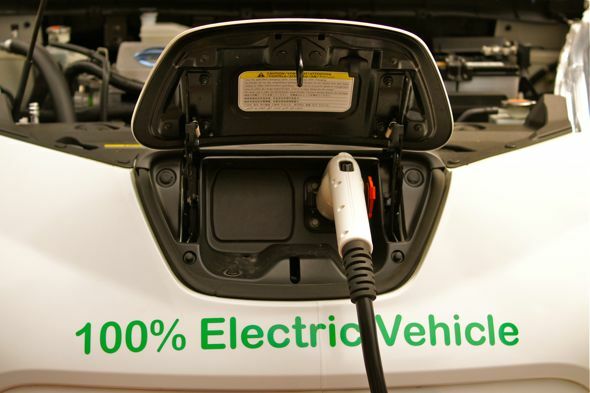 If you missed this show and are interested particularly in electric vehicles, keep an eye out for the EV Fest 2012 at the Evergreen Brick Works on Sept. 9.